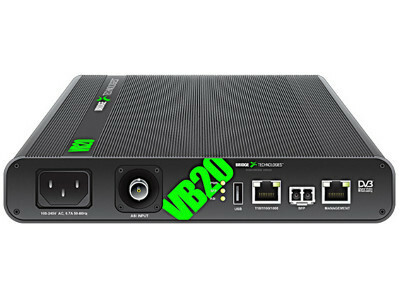 The VB20 is ideal for the network technician tasked with commissioning new installations in IP networks where video is being carried. The unit is aimed at giving a full overview of video related issues that normally are impossible or very difficult to spot using traditional networking tools. Invaluable insight into network performance is gained by continuously monitoring important parameters such as packet jitter and MPEG packet loss due to lost or rearranged IP frames. The MediaWindow™ historical timeline view offers trending over up to 4 days in a detailed and easy to understand manner. Whether establishing or modifying service settings on complex routers and switches, the VB20 facilitates the whole process. The ability to monitor continuously 260 IP unicast or multicast streams with all relevant measurements logged makes the portable VB20 invaluable for field use. Its ruggedised exterior and fan-less design make this probe the perfect fault-finding tool for the mobile engineer. With full support for both the MPEG-2 TS and MFRTP encapsulation standards and all current codecs, the VB20 is the tool of choice. This is an invaluable helpmate for any network engineer attempting multicast detection on multiple VLANs or in the process of IGMP tracking. Fault finding in complex IP networks just got a lot easier. The power of confidence monitoring is further enhanced by continuous monitoring and alarming of parameters, bandwidth overflow/underflow and signal loss. Based on a highly sophisticated threshold template system alarm granularity can be set to reflect actual status, irrelevant alarms being effectively masked. The unique FSM™ framework also allows checking and continuous monitoring of middleware and network services vital to customer QoE. SNMP trapping and XML export enable the IP-Probes to be implemented in any NMS system (with alarm generation either directly from the probes themselves, or via the VBC server for advanced alarm correlation and filtering). Each IP-Probe runs an HTTP server with the client as a web browser, so no need to install custom software on computers needing access to the measurement data. Modern web techniques such as AJAX are used to facilitate advanced interface behaviour in a standard web browser without the need for any plug-ins.